My good friend Robin K. lent me her copy of Paul Newman and A.E. 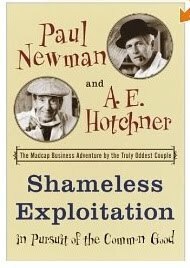 Hotchner's great book "Shameless Exploitation: In Pursuit of the Common Good." 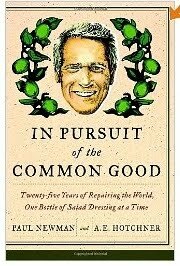 In 2008, the year of Paul Newman's passing, this was republished as "In Pursuit of the Common Good: Twenty-Five Years of Improving the World, One Bottle of Salad Dressing at a Time." My goodness. What a contribution these explorers provided to all of us interested in food, philanthropy, and economic development. "Sometimes you get what you want but it ain't what you expected. Newman's Own was supposed to be a tiny boutique operation - parchment labels on elegant wine bottles of antique glass. We expected train wrecks along the way and got, instead, one astonishment followed by another. We flourished like weeds in the garden of Wishbone, like silver in the vaults of finance. A lot of time we thought we were in first gear we were really in reverse, but it didn't seem to make any difference. We anticipated sales of $1,200 a year, and a loss, despite our gambling winnings, of $6,000. But in these twenty years we have earned over $150 million, which we've given to countless charities. How to account for this massive success? Pure luck? Transcendental meditation? Machiavellian manipulation? Aerodynamics? High calonics? We haven't the slightest idea." "That bottle of salad dressing that we concocted as a prank in Newman's old stable twenty-odd years ago has had a hell of a ride. Without realizing it, by being both stupid and stubborn we stuck to our guns, insisted on all-natural, no preservatives products, and in some small way caused an industry to change its ways. A business we ran by the seat of our pants, without plans or budgets, is now a significant player in the world's markets. A camp we built in Connecticut for sick children has now been duplicated for afflicted kids all over the world. A vision realized. Like a grain of sand in the oyster, it just grew, and for us, these camps are indeed the pearls. So, whatever it is, whatever it amounts to, whatever it does or doesn't do, we grabbed it by the shirttailand hung on. Sure makes a believer out of you." So here is my own shameless pitch... the Wisconsin Innovation Kitchen is a state of the art food processing center that can supply all the needs of a ‘virtual’ food entrepreneur - purchasing, ingredient prepping, recipe testing and preparation, packaging, labeling, storage, and shipping. You can utilize the Wisconsin Innovation Kitchen to be your safe, legal, wonderful food preparation center, operated for whatever worthy purpose you designate, from wherever you live. The Innovation Kitchen also supports the employment goals of adults with disabilities. With your help and patronage, we can do this all over the world. For people who would like to experiment in food entrepreneurship and philanthropy the Innovation Kitchen is a perfect storm of good news. Wikipedia Newman's Own. "According to the Newman's Own website, by March 2010 over US$290 million had been generated for charity since 1982"